Kūkai (空海), also known posthumously as Kōbō-Daishi (弘法大師, The Grand Master Who Propagated the Buddhist Teaching), 774–835, was a Japanese monk, civil servant, scholar, poet, and artist, founder of the Shingon or "True Word" school of Buddhism. Shingon followers usually refer to him by the honorific titles of O-Daishi-sama (お大師様) and Henjō-Kongō (遍照金剛). 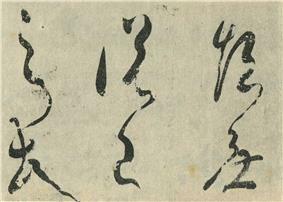 Kūkai is famous as a calligrapher (see Japanese calligraphy) and engineer. Among the many achievements attributed to him is the invention of the kana, the syllabary with which, in combination with Chinese characters (kanji), the Japanese language is written to this day. Also according to tradition, the Iroha, which uses every phonetic kana syllable just once and is one of the most famous poems in Japanese, is attributed to him but again, this is popular belief and nowhere attested to. His religious writings, some fifty works, expound the tantric Buddhist Shingon doctrine. The major ones have been translated into English by Yoshito Hakeda (see references below). 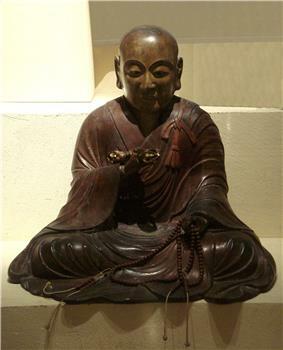 Wood statue of Kōbō Daishi/ Kūkai. Kūkai was born in 774 in the present-day Zentsū-ji precincts in the province of Sanuki on the island of Shikoku. His family were members of the aristocratic Saeki family, a branch of the ancient Ōtomo clan. There is some doubt as to his birth name: Tōtomono (precious one) is recorded in one source, while Mao (True Fish) is recorded elsewhere. Mao is generally used in modern studies. Kūkai was born in a period of important political changes with Emperor Kanmu (alt. Kammu, r. 781–806) seeking to consolidate his power and to extend his realm, taking measures which included moving the capital of Japan from Nara ultimately to Heian (modern-day Kyoto). Little more is known about Kūkai's childhood. At the age of fifteen, he began to receive instruction in the Chinese Classics under the guidance of his maternal uncle. During this time, the Saeki-Ōtomo clan suffered government persecution due to allegations that the clan chief, Ōtomo Yakamochi, was responsible for the assassination of his rival Fujiwara Tanetsugu. The family fortunes had fallen by 791 when Kūkai journeyed to Nara, the capital at the time, to study at the government university, the Daigakuryō (大学寮). Graduates were typically chosen for prestigious positions as bureaucrats. Biographies of Kūkai suggest that he became disillusioned with his Confucian studies, but developed a strong interest in Buddhist studies instead. 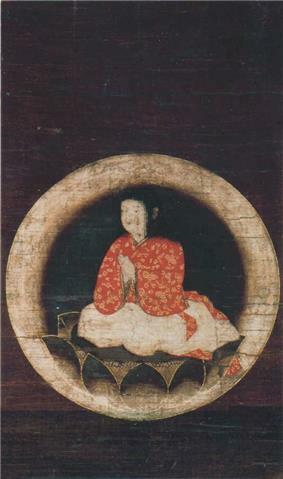 Around the age of 22, Kūkai was introduced to Buddhist practice involving chanting the mantra of the Bodhisattva Ākasagarbha (Kokuzō). During this period Kūkai frequently sought out isolated mountain regions where he chanted the Ākasagarbha mantra relentlessly. At age 24 he published his first major literary work, Sangō Shiiki, in which he quotes from an extensive list of sources, including the classics of Confucianism, Taoism, and Buddhism. The Nara temples, with their extensive libraries, possessed these texts. During this period in Japanese history, the central government closely regulated Buddhism through the Sōgō (僧綱, Office of Priestly Affairs) and enforced its policies, based on the Ritsuryō system. Ascetics and independent monks, like Kūkai, were frequently banned and lived outside the law, but still wandered the countryside or from temple to temple. During this period of private Buddhist practice, Kūkai had a dream, in which a man appeared and told Kūkai that the Mahavairocana Sutra is the scripture which contained the doctrine Kūkai was seeking. Though Kūkai soon managed to obtain a copy of this sūtra which had only recently become available in Japan, he immediately encountered difficulty. Much of the sūtra was in untranslated Sanskrit written in the Siddham script. Kūkai found the translated portion of the sūtra was very cryptic. Because Kūkai could find no one who could elucidate the text for him, he resolved to go to China to study the text there. Professor Abe suggests that the Mahavairocana Tantra bridged the gap between his interest in the practice of religious exercises and the doctrinal knowledge acquired through his studies. 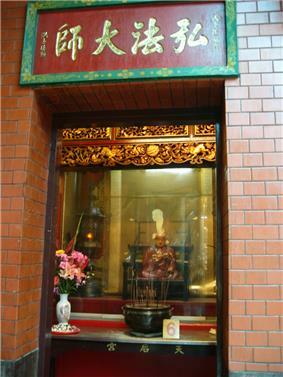 Kōbō Daishi altar at Tian Hou Temple in Taipei. In 804 Kūkai took part in a government-sponsored expedition to China in order to learn more about the Mahavairocana Sutra. Scholars are unsure why Kūkai was selected to take part in an official mission to China, given his background as a private, not state-sponsored, monk. Theories include family connections within the Saeki-Ōtomo clan, or connections through fellow clergy or a member of the Fujiwara clan. The expedition included four ships, with Kūkai on the first ship, while another famous monk, Saichō was on the second ship. During a storm, the third ship turned back, while the fourth ship was lost at sea. Kūkai's ship arrived weeks later in the province of Fujian and its passengers were initially denied entry to the port while the ship was impounded. Kūkai, being fluent in Chinese, wrote a letter to the governor of the province explaining their situation. The governor allowed the ship to dock, and the party was asked to proceed to the capital of Chang'an (present day Xi'an), the seat of power of the Tang Dynasty. After further delays, the Tang court granted Kūkai a place in the Ximingsi temple where his study of Chinese Buddhism began in earnest as well as studies of Sanskrit with the Gandharan pandit Prajñā (734-810?) who had been educated at the Indian Buddhist university at Nalanda. Huiguo immediately bestowed upon Kūkai the first level Abhisheka or esoteric initiation. Whereas Kūkai had expected to spend 20 years studying in China, in a few short months he was to receive the final initiation, and become a master of the esoteric lineage. Huiguo was said to have described teaching Kūkai as like "pouring water from one vase into another". Huiguo died shortly afterwards, but not before instructing Kūkai to return to Japan and spread the esoteric teachings there, assuring him that other disciples would carry on his work in China. Kūkai arrived back in Japan in 806 as the eighth Patriarch of Esoteric Buddhism, having learnt Sanskrit and its Siddham script, studied Indian Buddhism, as well as having studied the arts of Chinese calligraphy and poetry, all with recognized masters. He also arrived with a large number of texts, many of which were new to Japan and were esoteric in character, as well as several texts on the Sanskrit language and the Siddham script. However, in Kūkai's absence Emperor Kammu had died and was replaced by Emperor Heizei who exhibited no great enthusiasm for Buddhism. Kukai's return from China was eclipsed by Saichō, the founder of the Tendai school, who found favor with the court during this time. Saichō had already had esoteric rites officially recognised by the court as an integral part of Tendai, and had already performed the abhisheka, or initiatory ritual, for the court by the time Kūkai returned to Japan. Later, with Emperor Kammu's death, Saichō's fortunes began to wane. Saichō requested, in 812, that Kūkai give him the introductory initiation, which Kūkai agreed to do. He also granted a second-level initiation upon Saichō, but refused to bestow the final initiation (which would have qualified Saichō as a master of esoteric Buddhism) because Saichō had not completed the required studies, leading to a falling out between the two that was not resolved; this feud later extended to the Shingon and Tendai sects. 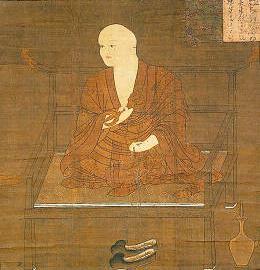 Little is known about Kūkai's movements until 809 when the court finally responded to Kūkai's report on his studies, which also contained an inventory of the texts and other objects he had brought with him, and a petition for state support to establish the new esoteric Buddhism in Japan. That document, the Catalogue of Imported Items, is the first attempt by Kūkai to distinguish the new form of Buddhism from that already practiced in Japan. The court's response was an order to reside in the Takaosan (later Jingo-ji) Temple in the suburbs of Kyoto. This was to be Kūkai's headquarters for the next 14 years. The year 809 also saw the retirement of Heizei due to illness and the succession of the Emperor Saga, who supported Kūkai and exchanged poems and other gifts. 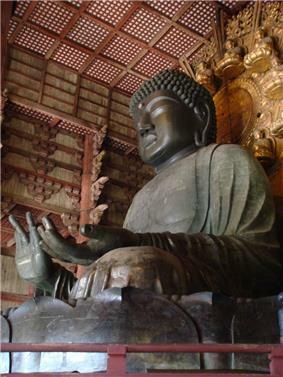 In 810 Kūkai emerged as a public figure when he was appointed administrative head of Tōdai-ji, the central temple in Nara, and head of the Sōgō (僧綱, Office of Priestly Affairs). Shortly after his enthronement Saga became seriously ill, and while he was recovering, Heizei fomented a rebellion, which had to be put down by force. Kūkai petitioned the Emperor to allow him to carry out certain esoteric rituals which were said to "enable a king to vanquish the seven calamities, to maintain the four seasons in harmony, to protect the nation and family, and to give comfort to himself and others". The petition was granted. Prior to this, the government relied on the monks from the traditional schools in Nara to perform rituals, such as chanting the Golden Light Sutra to bolster the government, but this event marked a new reliance on the esoteric tradition to fulfill this role. All of these were written in 817. Records show that Kūkai was also busy writing poetry, conducting rituals, and writing epitaphs and memorials on request. His popularity at the court only increased, and spread. Meanwhile, Kukai's new esoteric teachings and literature drew scrutiny from a noted scholar-monk of the time named Tokuitsu, who traded letters back and forth in 815 asking for clarification. The dialogue between them proved constructive and helped to give Kūkai more credibility, while the Nara Schools took greater interest in esoteric practice. In 816, Emperor Saga accepted Kūkai's request to establish a mountain retreat at Mount Kōya as a retreat from worldly affairs. The ground was officially consecrated in the middle of 819 with rituals lasting seven days. He could not stay, however, as he had received an imperial order to act as advisor to the secretary of state, and he therefore entrusted the project to a senior disciple. As many surviving letters to patrons attest, fund-raising for the project now began to take up much of Kūkai's time, and financial difficulties were a persistent concern; indeed, the project was not fully realised until after Kūkai's death in 835. Kūkai's vision was that Mt. Kōya was to become a representation of the two mandalas that form the basis of Shingon Buddhism: the central plateau as the Womb Realm mandala, with the peaks surrounding the area as petals of a lotus; and located in the centre of this would be the Diamond Realm mandala in the form of a temple which he named Kongōbu-ji — the Diamond Peak Temple. At the center of the temple complex sits an enormous statue of Mahavairocana Buddha who is the personification of Ultimate Reality. In 821 Kūkai took on a civil engineering task, that of restoring Manno Reservoir, which is still the largest irrigation reservoir in Japan. His leadership enabled the previously floundering project to be completed smoothly, and is now the source of some of the many legendary stories which surround his figure. In 822 Kūkai performed an initiation ceremony for the ex-emperor Heizei. In the same year Saichō died. When Emperor Kammu had moved the capital in 784, he had not permitted the powerful Buddhists from the temples of Nara to follow him. He did commission two new temples: Tō-ji (Eastern Temple) and Sai-ji (Western Temple) which flanked the road at southern entrance to the city, protecting the capital from evil influences. However, after nearly thirty years the temples were still not completed. In 823 the soon-to-retire Emperor Saga asked Kūkai, experienced in public works projects, to take over Tō-ji and finish the building project. 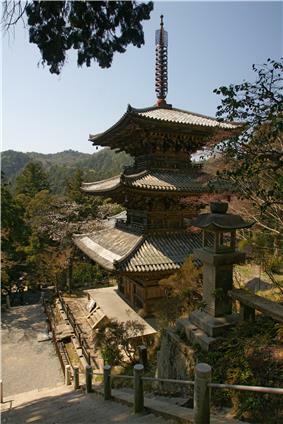 Saga gave Kūkai free rein, enabling him to make Tō-ji the first Esoteric Buddhist centre in Kyoto, and also giving him a base much closer to the court, and its power. The new emperor, Emperor Junna (r. 823-833) was also well disposed towards Kūkai. In response to a request from the emperor, Kūkai, along with other Japanese Buddhist leaders, submitted a document which set out the beliefs, practices and important texts of his form of Buddhism. In his imperial decree granting approval of Kūkai's outline of esoteric Buddhism, Junna uses the term Shingon-shū (真言宗, True Word School) for the first time. An imperial decree gave Kūkai exclusive use of Tō-ji for the Shingon School, which set a new precedent in an environment where previously temples had been open to all forms of Buddhism. 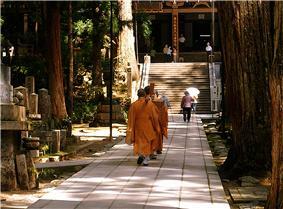 It also allowed him to retain 50 monks at the temple and train them in Shingon. This was the final step in establishing Shingon as an independent Buddhist movement, with a solid institutional basis with state authorization. Shingon had become legitimate. In 824 Kūkai was officially appointed to the temple construction project. In that year he founded Zenpuku-ji, the second oldest temple of the Edo (Tokyo) region. In 824 he was also appointed to the Office of Priestly Affairs. The Office consisted of four positions, with the Supreme Priest being an honorary position which was often vacant. The effective head of the Sōgō was the Daisōzu (大僧都, Senior Director). Kūkai's appointment was to the position of Shōsōzu (小僧都, Junior Director). In addition there was a Risshi (律師, Vinaya Master) who was responsible for the monastic code of discipline. At Tō-ji, in addition to the main hall (kondō) and some minor buildings on the site, Kūkai added the lecture hall in 825 which was specifically designed along Shingon Buddhist principles, which included the making of 14 Buddha images. Also in 825, Kūkai was invited to become tutor to the crown prince. Then in 826 he initiated the construction of a large pagoda at Tō-ji which was not completed in his lifetime (the present pagoda was built in 1644 by the third Tokugawa Shogun, Iemitsu). In 827 Kūkai was promoted to be Daisōzu in which capacity he presided over state rituals, the emperor and the imperial family. The year 828 saw Kūkai open his School of Arts and Sciences (Shugei shuchi-in). The school was a private institution open to all regardless of social rank. This was in contrast to the only other school in the capital which was only open to members of the aristocracy. The school taught Taoism and Confucianism, in addition to Buddhism, and provided free meals to the pupils. The latter was essential because the poor could not afford to live and attend the school without it. The school closed ten years after Kūkai's death, when it was sold in order to purchase some rice fields for supporting monastic affairs. Monks bringing food to Kōbō Daishi on Mount Kōya, as they believe he is not dead but rather meditating. They feed him every day and change his clothes. No one except the highest monks are allowed to see him. Kūkai completed his magnum opus, The Jūjūshinron (十住心論, Treatise on The Ten Stages of the Development of Mind) in 830. Because of its great length, it has yet to have been fully translated into any language. A simplified summary, Hizō Hōyaku (秘蔵宝鑰, The Precious Key to the Secret Treasury) followed soon after. The first signs of the illness that would eventually lead to Kūkai's death appeared in 831. He sought to retire, but the emperor would not accept his resignation and instead gave him sick leave. Toward the end of 832 Kūkai was back on Mt. Kōya and spent most of his remaining life there. In 834 he petitioned the court to establish a Shingon chapel in the palace for the purpose of conducting rituals that would ensure the health of the state. This request was granted and Shingon ritual became incorporated into the official court calendar of events. In 835, just two months before his death, Kūkai was finally granted permission to annually ordain three Shingon monks at Mt. Kōya — the number of new ordainees being still strictly controlled by the state. This meant that Kōya had gone from being a private institution to a state-sponsored one. ^ a b c d Hakeda, Yoshito S. (1972). Kūkai and His Major Works. Columbia University Press. ^ a b c d e Abe, Ryuichi (1999). The Weaving of Mantra: Kukai and the Construction of Esoteric Buddhist Discourse. Columbia University Press. ^ Brown, Delmer et al. (1979). Gukanshō, p. 284. ^ Yusen Kashiwahara, Koyu Sonoda "Shapers of Japanese Buddhism", Kosei Pub. Co. 1994. "Kukai"
Wayman, A and Tajima, R. 1998 The Enlightenment of Vairocana. Delhi: Motilal Barnasidass [includes Study of the Vairocanābhisambodhitantra (Wayman) and Study of the Mahāvairocana-Sūtra (Tajima)].